Ole Gunnar Solskjaer showed he's still a specialist in delivering last-minute victories for Manchester United in the Champions League. Paris Saint-Germain, though, remains a specialist in failure on Europe's biggest stage. 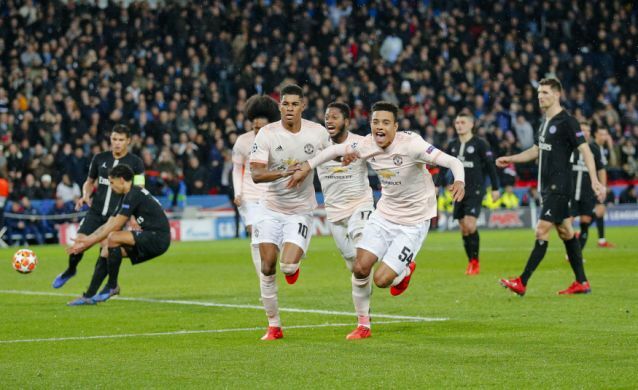 Marcus Rashford's injury-time penalty sent Solskjaer's revitalized side through to the Champions League quarterfinals on Wednesday, securing a 3-1 win at PSG to overturn a two-goal deficit from the first leg. Solskjaer, who scored an injury-time winner in the final to cap a late comeback for United in 1999, oversaw more late drama 20 years later. It was the first time in Champions League history that a team lost the first leg at home by a two-goal margin and still went through. United has yet to confirm whether Solskjaer will get the job on a full-time basis, despite the former Norway striker having completely transformed the side after replacing Jose Mourinho. This win, though, will have strengthened his chances considerably — although Solskjaer isn't taking anything for granted. "It's been a fantastic time with the players and the staff I've got," Solskjaer said. "I'm going to enjoy my job as long as I've got it. ... I'm going to smile." For PSG, there was only reason for despair. The big-spending French club once again fell apart in a favorable position, two years after also making history in the last 16 by throwing away a 4-0 lead against Barcelona and losing 6-1 in the return leg. Coach Thomas Tuchel, hired after predecessor Unai Emery went out in the last 16 two years running, clung hopefully to the idea his side played better over the two legs in what he describe as a "crazy" match. "It's very hard to lose and very hard to accept," he said. "We didn't deserve to go out after 180 minutes." Referee Damir Skomina awarded United's penalty after a lengthy video review that showed defender Presnel Kimpembe jumping up to block Diogo Dalot's shot with his elbow. Rashford kept his nerve for the spot kick, blasting the ball past Gianluigi Buffon to send the United fans to his left into raptures. "The kid is fearless. He's got no doubt. Slotted it in. Brilliant," Solskjaer said. "I hope (the penalty) was the right decision." Tuchel refused to blame VAR. "I'm a big supporter of VAR and I stay a big supporter. With the hand it's a super difficult thing because there are too many points: do we punish it or not punish it?" he said. "I think it's a 50-50 decision, it's difficult. There are reasons why you can give this penalty." Neymar, who is recovering from injury and watched on in horror from the sideline as the penalty was taken, disagreed. He blasted the officials angrily on his Instagram account. "This is a disgrace!" he wrote. "And they put four guys that do not understand football to watch it in slow motion." Neymar also aimed an expletive at the officials. United's players were far happier after a ninth straight away win. As they sprinted to celebrate with their fans at the final whistle, Kimpembe lay flat on the ground for several moments as a stunned Parc des Princes crowd looked on in disbelief. VAR played a key part in the night's other match, too. Alex Telles scored a penalty in extra time to send Porto into the quarterfinals with a 3-1 victory over Roma, overturning a one-goal deficit from the first leg. He converted the spot kick after Alessandro Florenzi had been penalized following a review. United were only given a slim chance going into the game, with Solskjaer's task made even harder by the fact that 10 of his players were either injured or suspended. That included midfielder Paul Pogba, who was sent off at Old Trafford. "Everything seemed to be against us, but we're used to that," Rashford said. "We showed what we're about today and got the result we needed." United was handed an immediate lifeline when PSG gifted United striker Romelu Lukaku a second-minute opening goal. The burly Belgium striker intercepted a back pass from Thilo Kehrer, rounded Buffon and slid the ball in from a tight angle. Left back Juan Bernat equalized for PSG in the 12th, turning in a cross at the back post after Kylian Mbappe got behind United's static defense. Then, the hugely experienced Buffon spilled a low shot from Rashford and Lukaku turned in the rebound. "We agreed that when Marcus steps out on the press that I would follow," Lukaku said. "I told him every time he shoots I'll follow the ball." Sensing Buffon's uncertainty, Rashford fired another shot just wide as United finished the first half strongly. PSG's defense was having another one of its bad nights, a recurring theme during the knockout stages of a competition it has never won. Therefore PSG played tentatively during the second half, knowing United needed only one goal to qualify on the away goals rule. PSG winger Angel Di Maria scored with a delightful clip over the advancing De Gea after being put though by Mbappe's clever flick in the 56th. But it was ruled out for offside. Mbappe remained PSG's biggest threat, and his pace took him clear through on goal with six minutes left only for the France star to stumble and for Bernat to smack the loose ball against the post.